If you read my last post, you’d know that Spring has not yet sprung. The weather is still cold and I am still wearing tights under my skirts to work every day. But you know what? You cannot let that get in between me and baseball. If you have never been to a baseball game, please go on to your local team’s webpage, check out the next home game, buy tickets, and thank me later. Baseball on TV is boring. Go to a baseball game. Buy a team shirt. Make some friends. SO worth it. I have to admit that I used to not be a big baseball fan, but in 2008, I started watching the (then) Florida Marlins on the regular. My (then) roommate is a huge New York Mets fan, so every time they played the Marlins, I would take the 45 minute drive to see them. Fast forward to last year, I watched the Mets play in four different cities! Would I consider myself a Mets fan? Absolutely. However, since moving to Maryland, I have adopted the Washington Nationals to be the team to watch. So before you start thinking that I am skipping work to attend a baseball game, you should probably know that I work a different work schedule allowing me to take every other Monday off. 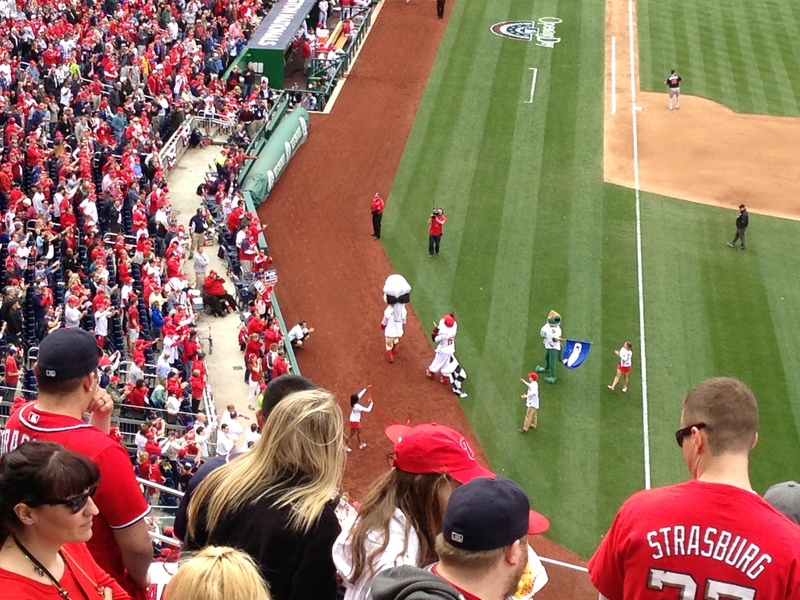 The stars aligned in my favor , so my day off coincided with the Washington Nationals Opening Day! My roommate is a teacher so she was on Spring Break and was able to come to the game with me. Thanks to stubhub, we got great last minute tickets and we were off. Courtney and I woke up Monday morning to a most beautiful day. 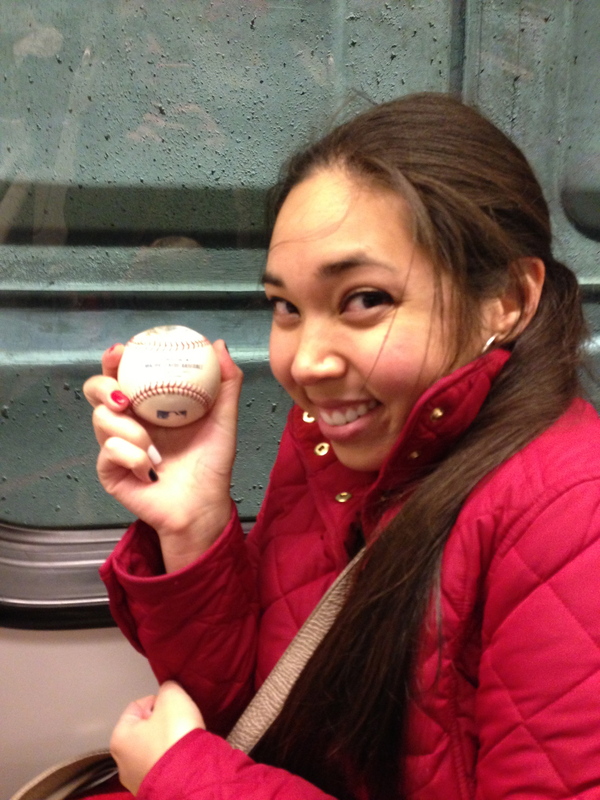 After going to Panera for our morning coffee and power breakfast, we were off to Nationals Stadium… along with a gazllion other people. It was a nice and warm afternoon where we were able to enjoy the sounds of Scott’s New Band and dance along to the music before the game started. 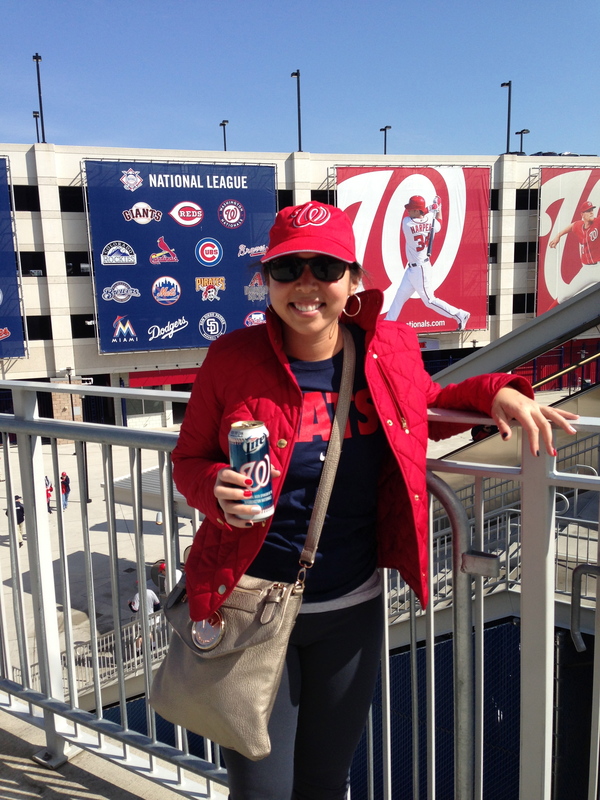 Also, for all you Nationals fans, if you get to the game early, head to the bar upstairs! Beers are only $5 until the first pitch is thrown. Ignore if you are under the age of 21. Anyway, we drank some nice cool beverages that went along with the warm weather. We even walked around the stadium and saw a bunch of cool new additions to the stadium! Walking around the stadium, we learned two things: 1. A lot of people took the day off/played hookey 2. The Nats are going to kill it this season. The stadium was packed. The energy was amazing, and it was just so exciting to be at the game. The game was so popular that the stadium resorted to selling standing room only tickets. Luckily, I had an actual seat. Phew! 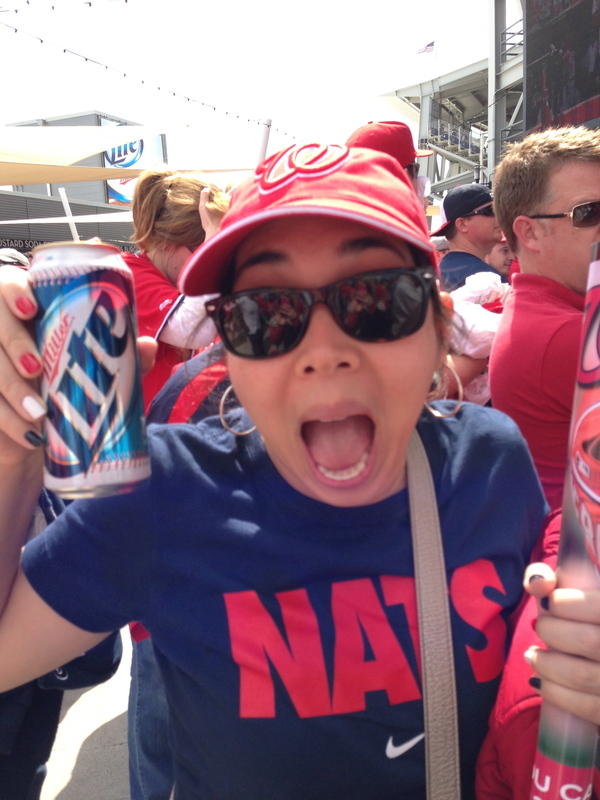 Anyway, the Nats played the Marlins aka my hometown team. I have to tell you, I am not a Marlins fan. I enjoyed it when they were the Florida Marlins and I got to wear cool Marlins attire when they won the World Series, but ever since they became the Miami Marlins, I could care less. 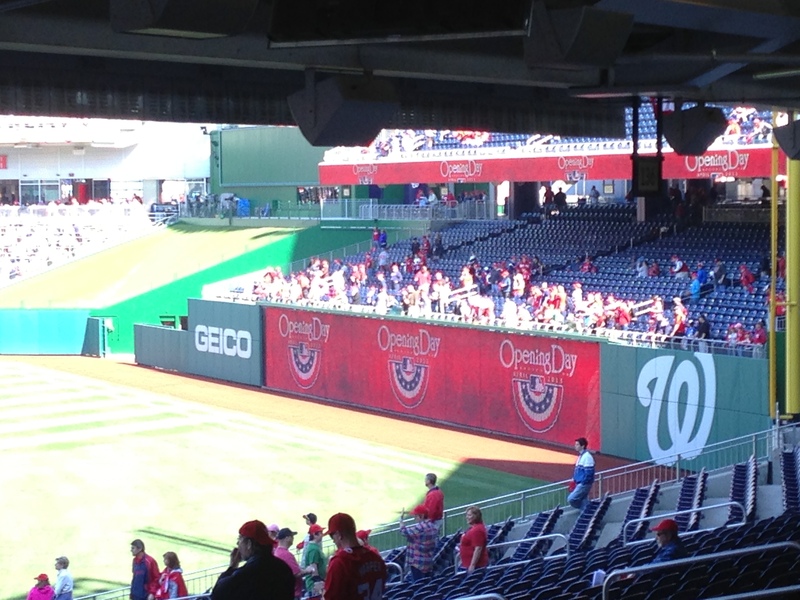 (Hence the adoption of the Washington Nationals) I believe the Marlins players are also Nats fans because the Nats ended up winning 2-0. So I’d say that Opening Day was a success. And you know what? I even got a little parting gift. Previous Post It’s finally (sortof) Spring!